The glycoside hydrolase-catalyzed polycondensation of activated glycosyl monomers such as glycosyl fluorides and polyaddition of sugar-oxazoline monomers have been reviewed. Various kinds of oligo- and polysaccharides including natural cellulose, xylan, chitin, hyaluronic acid, and specifically modified functional polysaccharides have successfully been prepared by this methodology. 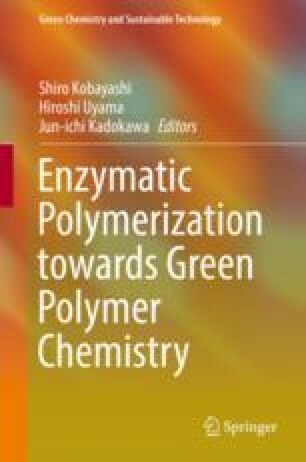 Based on the formation of metastable cellulose I by the enzymatic polymerization of β-cellobiosyl fluoride monomer catalyzed by cellulase, a new concept of “choroselective polymerization” for the control in high-order molecular assembly during polymerization was proposed. The use of sugar oxazolines as a glycosyl monomer with a distorted conformation allowed the polymerization to proceed only in the direction of the product polysaccharides while suppressing hydrolysis. Sugar oxazolines which possess higher potential energy compared with the conventional glycosyl donors enabled us to produce various N-acetylglucosamine-containing polysaccharides such as chitin, hyaluronic acid, and chondroitin. A new concept of “transition state analogue substrate” (TSAS) has been introduced to polymerization chemistry.